About Darryl S. Message Darryl S.
TOUR GUIDE RESPONSE: Thanks for your excellent rating.i appreciate it. Darryl is a delight. We went to areas that we would not of seen were not for this tour. Beautiful neighborhoods, beach and the views!! Great day. Loved that we could go at our own pace and weren't rushed. Thank you for a wonderful time. TOUR GUIDE RESPONSE: Thank you for.your fabulous review.I loved your company.You are a special interesting couple that I enjoyed showing my special local.spots to. Darryl was the perfect tour guide. She was very friendly, very well informed and eager to share all of the things she loves about Sydney. We did a short tour of the city and she showed me some of the wonderful Sydney neighborhoods that make the city so great. The tour was totally at MY pace and I appreciated that. I need to go back because we had only one short day to explore and there really is so much to see and so there. When I DO go back, I will call Darryl! TOUR GUIDE RESPONSE: Thank you for your fabulous review.You were delightful company.See you next time! Great overview of the greater Sydney area. Made arrangements to take care of us at the last minute and really knew her stuff - tkanks agian for setting up lunch - perfect place! 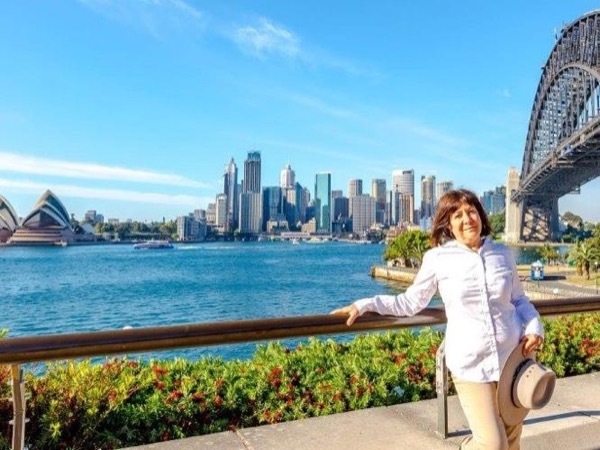 TOUR GUIDE RESPONSE: Hi Sharon, Thank you for your fabulous review.I loved spending time with you and your family and introducing you to this beautiful city. I am glad the information was useful so you could maximize the time you had here.I appreciate you taking the time to post a review. Darryl was awesome! During the short time that we had before she took us to the airport we were able to see so many of the famous sights of Sydney. She made sure I got to eat a famous Harry's meat pie. She carefully watched the time to be sure we would get to the airport in plenty of time. She is friendly and knowledgeable. It is obvious that she loves to show guests around this beautiful city. TOUR GUIDE RESPONSE: Thank you so much for your terrific review I loved showing you guys around and am so happy you got to try that famous Tiger pie! We totally enjoyed our morning with Daryl. We found it so interesting to learn of the thriving Jewish Community in Sydney. She also was knowlageable about all things Sydney and was eager to share as much as she could with and we got to see so much of what we wouldn't have been able to see on other tours. We would totally recommend this tour!!! TOUR GUIDE RESPONSE: Thank you so much for your wonderful review Barbara.I thoroughly enjoyed my time with you guys. What more can I say than excellent. On time, great choice of locations to visit, efficient use of time, informative history lesson and selection of historical stops, friendly guide, comfortable transportation, beautiful views. Overall everything an out of town visitor could hope to receive on a tour of Sydney. Thanks. TOUR GUIDE RESPONSE: Thank you for your fabulous review.I really appreciate it. I had a great time with you and the gang. We could not imagine a warmer, more knowledgeable, or friendly tour guide in Sydney. Thank you Darryl for helping to make our stay in your beautiful city so insightful and fun! TOUR GUIDE RESPONSE: Thank you for such a beautiful review.I enjoyed my day with you too. We both enjoyed Darryl and her knowledge and love of Sydney. We thought that the tour was a bit long for her topic and what there is to see. I would suggest that she offer two options: (1) Jewish Heritage tour-maybe 2 hours-and could add another designated site unrelated to Jewish history for extended time and (2) option to include Holocaust Museum and Jewish shops-4 hours. Since we were not interested in the Museum or shops, I think that Darry struggled to fill our time slot. TOUR GUIDE RESPONSE: Hi Thank you for your feedback.My Jewish Heritage Tour takes in a lot of Sydney .There is so much to show my visitors I usually do not have enough time.The visit to the Jewish Museum and shops is listed on the itinerary description and if you are not interested in either you could have expressed this to me and I would have amended it to suit. TOUR GUIDE RESPONSE: Thanks so much for your wonderful review.I really appreciate it. Darryl was teriffic. She showed up exactly on time, knew the history of Sydney both Jewish and non-Jewish. Had a hands on tour where we met people in the community and got to see all of the important sites in Sydney both with and without Jewish history. I would recommend her for anyone who wants to take this tour, or even take any tour in Sydney. TOUR GUIDE RESPONSE: Thanks so much for you terrific review.I really appreciate you recommending me. We had a fabulous time we Darryl. Excellent tour guide and more importantly very personable. Had a tremendously enjoyable day and learned an amazing amount of insight about the Sydney Jewish Community. Yummy Jewish food along the way too. TOUR GUIDE RESPONSE: Thank you so much for your fabulous review.I loved my time with you guys and am so glad we got to enjoy Jewish Sydney together,food and all! Daryl loves her city and conveys it with enthusiasm and knowledge. If you're interested in all the nocks and crannies, beaches, lookouts, shops, lifestyle, and historical perspective, Daryl is the guide for you. Her personable, caring and knowledgeable introduction to Sydney left us knowing we made the perfect decision. A very professional and interesting day with Darryl. We had been in Sydney several years ago, tried to "see" the city on our own, but left feeling that it had little to offer. Darryl has turned us around. Our few post-cruise hours together showed us a beautiful and vibrant Sydney. Thanks so much for everything, Darryl, and hoping to meet up again soon! Darryl was absolutely fabulous! One of the best tour guides we have ever used. I would not go back to Sydney without reaching out to Darryl first! Friendly and knowledgeable. Had an itinerary planned but we were able to tweak it to our desire. Unfortunately it was Passover and the Jewish points of interest were closed. Would use again if we visit in the future and recommend Darryl. TOUR GUIDE RESPONSE: Thank you for your rating Ruth and for taking the time to do it.It is a pity much was closed due to the Passover holiday and I would be delighted to have you guys with me again. Everything about Darryl and this tour was incredible. We saw SO much of Sydney and heard SO much about it that we can't wait to return. Darryl clearly loves what she does and is very professional and knowledgeable. It was a pleasure to spend four hours with her. TOUR GUIDE RESPONSE: I loved my day with you too!You guys have totally inspired me,I want to be like you when I *Grow up* Thanks for such a great review. Daryl is a wonderful guide with extensive knowledge of the area. We greatly enjoyed our tour with him and highly recommend it. My wife and I had a wonderful tour of Sydney with Darryl. She was informative and enthusiastic, and provided us with loads of interesting and valuable information about Sydney and the surrounding areas that we would never have learned without her. She also went out of her way to arrange for us to gain entry to a beautiful Synagogue. We would highly recommend her for any tour. TOUR GUIDE RESPONSE: Thank you for your fabulous review.I loved my time with you two and appreciate your review so much.I hope to see you guys again. Our tour of Jewish Sidney was exceptional. It provided us not only with the Jewish history of Sydney, but also a great orientation to the city and its many neighborhoods and monuments. Our guide, Darryl S, was terrific in every way. Her obvious knowledge and enthusiasm for her adopted city made the time with her an absolute delight. Highly recommended. TOUR GUIDE RESPONSE: Wow Thank you for your exceptional reviee.I really appreciate it .You guys were so much fun too ! We were well pleased with Darryl. Was prompt, responsive to our requirements and generous with her time. Her itinerary was well thought out and gave us a good first insight to Sydney, with a good commentary. She made a rainy day delightful and gave us a perfect over view of the city and the Jewish areas. We highly recommend Tours by Locals and Darryl for any tour of Sydney. TOUR GUIDE RESPONSE: Thank you for such a great review.You guts were amazing too ! TOUR GUIDE RESPONSE: Hi Paul and Ellen,apologies for the late response.Thank you so much for your fabulous review.I really appreciate it. TOUR GUIDE RESPONSE: Thanks Bill! Darryl was knowledgeable, warm and so intuitive. Picked up on our interests and geared the time to them. She wanted to show off her beautiful Sydney, and did a great job! Our only disappointment was.... not spending more time with Darryl! Not only does she really know Sydney, its surrounding environs, and the history of Australia, but she is so charismatic and delightful to spend time with! We especially enjoyed the Jewish highlights -- and cappuccino at Bills in Bondi Junction. We would use Darryl again and again in a heartbeat! TOUR GUIDE RESPONSE: Wow thank you for such a fabulous review!It was such a pleasure to have you guys tour with me and I feel like I have made two wonderful new friends.I am so glad you enjoyed it.